The Firefox web browser comes with built-in image and video viewers that are used by it if supported file types are not associated with other programs or browser extensions. 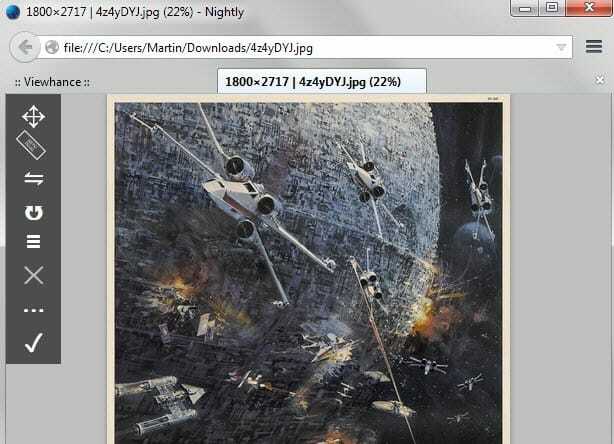 The image viewer is bare bones as it lets you view and zoom images, and so is the media player used by the browser. Viewhance is a new Firefox add-on that improves the functionality of these two viewers in Firefox. You gain immediate access to a large list of extra features and interface modifications right after installation. First thing you will probably notice is the new lighter background but that is just the tip of the iceberg. The extension adds more than ten different keyboard shortcuts to both viewers that support various "fit to" options, rotation and flipping, as well as easier zooming using + and - keys (opposed to Ctrl- and Ctrl+ in the default viewer). These shortcuts work in the image viewer and video viewer so that you can rotate, zoom or flip videos as easily as images from then on out. If you prefer to use the mouse, move the cursor to the left top corner of the screen to display a menu that provides similar functionality. One unique option in the menu are enhancements that you can apply to the image. It allows you to change brightness, contrast or saturation using sliders. Please note that the changes are not permanent and cannot be saved. The only option to save an enhanced image is to take a screenshot of it which is not ideal for a number of reasons. For instance, if the image is larger than the browser window size you may have a hard time capturing it in its entirety. Options don't end there though. 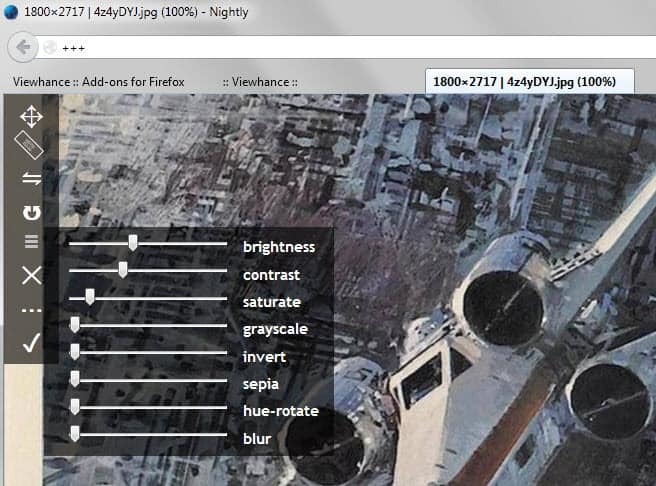 It allows you to define the initial sizing mode which can be useful if you want images to be displayed in their natural size all the time regardless of resolution or Firefox window size. Other options provided let you define how videos are handled when they are loaded in Firefox. While you can keep it at the default, you may disable autoplay or set a desired volume level for videos if you prefer that. Viewhance supports custom styles that you can apply to the viewer interface. It ships with styles that you can modify directly in the program options. If you use Firefox's native image or video player regularly, you may find Viewhance useful as it enhances both viewers significantly. Especially the customization options and shortcuts need to be mentioned in this regard as they work well out of the box. I was going to say that it uses the same icon as “Imagus” then I realized they’re both from the same creator. They both work well together. Very cool — I’ve been using the Imagus add-on (https://addons.mozilla.org/en-US/firefox/addon/imagus/) for months. Will have to check this out. Thanks Zzz and Martin. Not only that, viewhance was even part of imagus before the split. It’s been here fore a long time and is not really new, but is still pretty great. I don’t think it will change that as it does not change the underlying player but only your interaction with it.